In Part 1 of this lesson we looked at how to list files and folders in LiveCode. In this lesson we will extend on what we have already learned by using recursion. Recursion is simply the name given to the process where a handler or function calls itself. Recursion can allow problems to be expressed very succinctly and when properly used, it can make your code shorter and easier to read. However, recursion is often less efficient than iteration (using loops instead) and can lead to cryptic code that you have difficulty understanding yourself. If, when using recursion you find that you are struggling to understand how your code works, it is probably a good idea to try simplifying the code by using loops, even if this makes the scripts longer. Often simply getting the list of files in a single folder is not enough, many applications need also to include the files in sub folders. In English you can say that the list of files in any given folder consists of the list of files in that folder plus the list of files in each sub folder, this is exactly how this algorithm works, first listing the current files, then adding the list of files for each sub folder. We will start by setting up our interface as we did in Part 1. A field and button allowing us to choose a folder, a field to display the list of files and a button to get the list of files. As mentioned above a recursive algorithm is one that calls itself, be careful to include an exit case or your program could end up in an infinite loop. 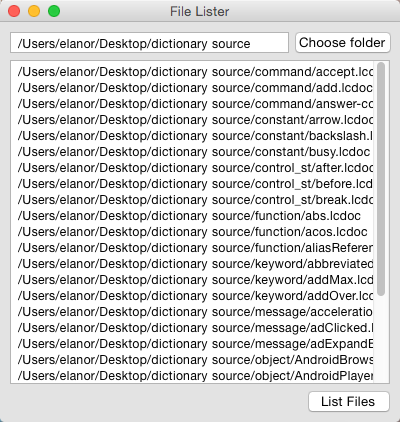 For our task we have a function listFiles which gets the contents of a folder, lists the files, and calls listFiles on each subfolder. We use a variable to store the list of files, adding to it each time we call listFiles. In this function we want to stop recursing when there are no more subfolders. # include files in subfolders if desired. The filtering functions are the same as those in Part 1 of this lesson. Hint: Note the way that repeat for each is used to loop through each folder. This is the most efficient way in LiveCode of looping through a list, and is much faster than using repeat with x=1 to the number of lines of tFolders. Remember to delete the last character of the created list after the repeat has finished! 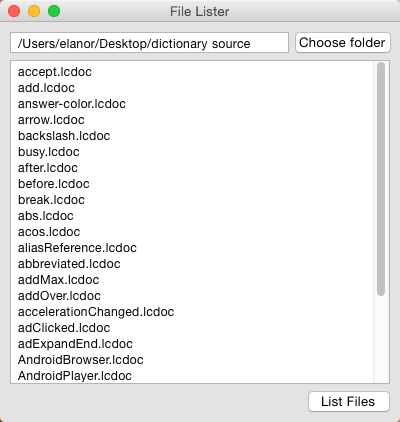 Hint: It is very easy to change this function to list folders instead of files, or to list both folders and files. To list folders instead just change filteredFiles() for filteredFolders() and be sure to rename the function and local variables so that they make sense. 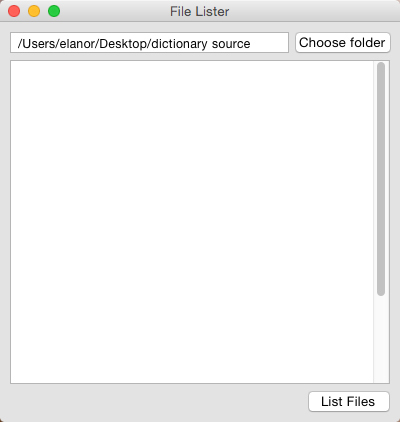 To list folders you simply add the filteredFolders() onto the end of the filteredFiles(). We can also use a recursive function to give us the full paths to all the files in a folder. Again the filteredFilesWithPaths function is the same one we used in Part 1, it simply prepends the defaultFolder to the filename of each file to give the full path. The return values of the files and folders functions in LiveCode are already sorted alphabetically, but if you want to obtain a properly sorted list of of files and or folders, it is necessary to sort the complete list after all recursion is complete. A flexible way of doing this is shown below. # from each file's name to allow the sorting to be fully customized. This code works by iterating through the list of files, and for each file, calling the listSortedFilesSortKey() function. This function takes the file's name and returns the string that LiveCode should use to sort this file. For a standard alphabetical sort, the name of the file is returned, but there are many other options, for example you could sort on the file's complete path instead by simply changing return pFile to return the defaultFolder & slash & pFile. Other possibilities include inverse sort, numeric sort and sort by extension which can be easily implemented. Next: How do I save custom properties in a standalone application?